During this time of year, Iceland is a gray place with lots of rain and low clouds. 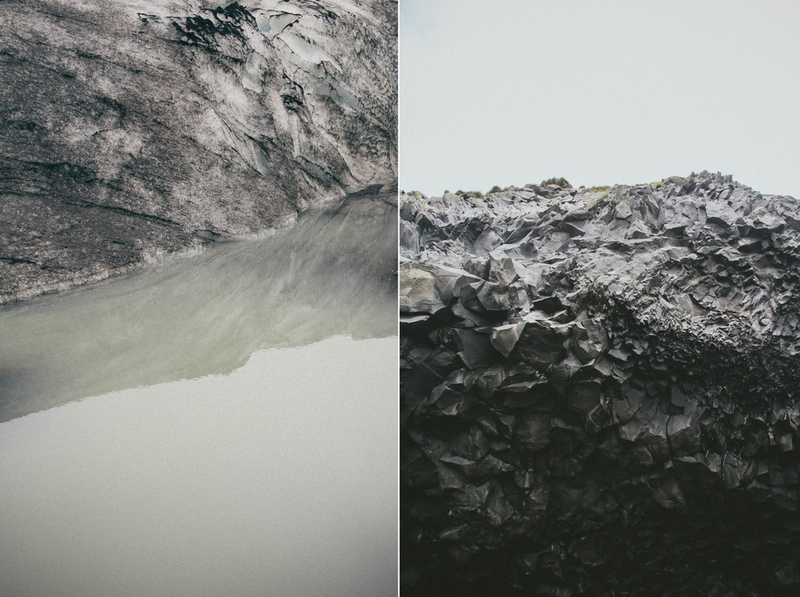 But the Basalt Cliffs and Skaftafell Glacier actually make grey look good. Specifically at the cliffs, surrounded by black sand, the details of stone are stunning. We made the decision when we left for Iceland to completely disconnect from the world: no email, no text messages, no phone calls (posting to Instagram was the only exception). I decided after this trip that disconnecting is absolutely my favorite way to travel. It allowed us both to fully live in the moment. Specifically in Iceland, when you can drive for hours and barely see any civilization, technology feels unnatural. The trip was such a beautiful reminder to seek peace and quiet every once in a while. To go on a lone adventure or curl up in the park with a book, to disconnect and reflect. During our week, we explored the southern part of the country. We quickly discovered (on a journey in our rental car that ended up in plenty of detours) that Iceland has the most unexpected terrain. One minute you are driving on a paved road looking out in the distance to see rolling hills and the next minute you are on a gravel road, dodging potholes and looking at a terrain that seems strikingly similar to what you picture the moon to be - giant fields of stones and black dirt. Then five minutes later you run into a waterfall. As soon as you get used to seeing one thing, you're in awe by the next. It's a pretty inspiring and incredible experience. + Going to the Blue Lagoon - yes, it may be the biggest tourist attraction, but it is one of the coolest places. + The charm of the town of Vik and the little church that sits above it. + The waterfalls! Each one of them, no matter how many you see, is different and mind-blowing and stunningly beautiful. + The horses! They are the only country with this original breed. They're gorgeous. Reykjavik served as our hub while we were in Iceland. During our first three days, we would venture out from the city in the morning and finish out our nights here with long walks and food coma-inducing meals. The city is charming. Buildings with colored roofs line the narrow streets and eye-catching pieces of art greet you around every corner. Although the biggest city in Iceland, it has a small town feel, making it easily walkable and equally enjoyable. It was in this city that we fell in love with the idea of experiencing part of the Iceland culture via tasting menus because we were told that the seafood here is some of the freshest in the world, and because we could never decide what to order. Along the way, we had our first tastes of whale, puffin, and horse. But it was the hot dogs from Bæjarins Beztu Pylsur that we absolutely plan to recreate - ketchup, sweet mustard, fried onion, raw onion, remoulade, and relish. Yes, please.